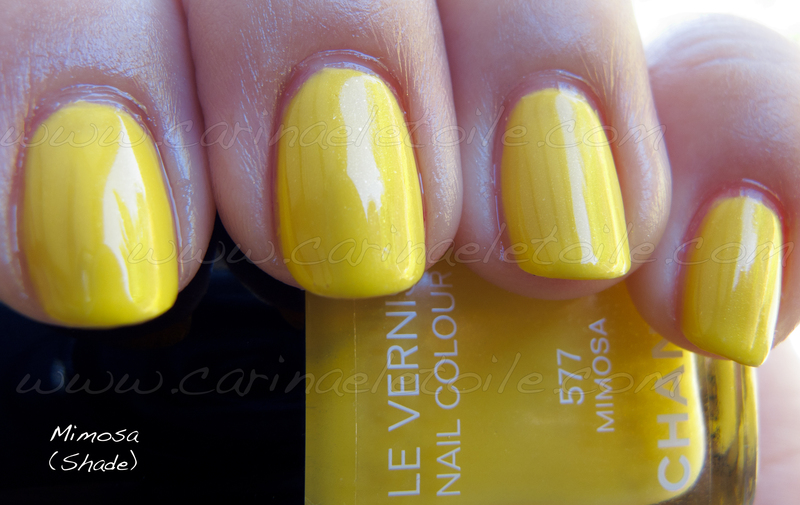 Chanel Mimosa is sold out and is part of their Summer 2011 Collection. I went to my Chanel counter and they had it! Woo hoo. It was meant to be. 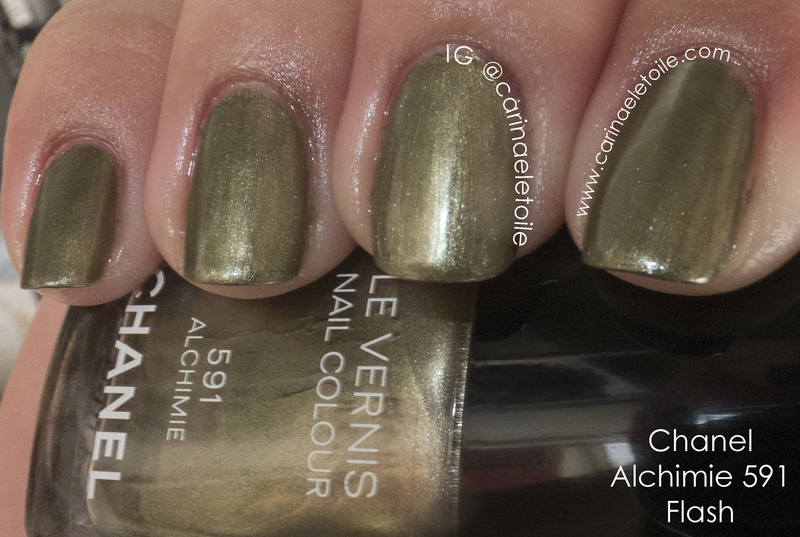 One of three colors for Chanel’s Flowers of Summer (Les Fleurs d’été), Mimosa is a shade I’m somewhat happy I chose. 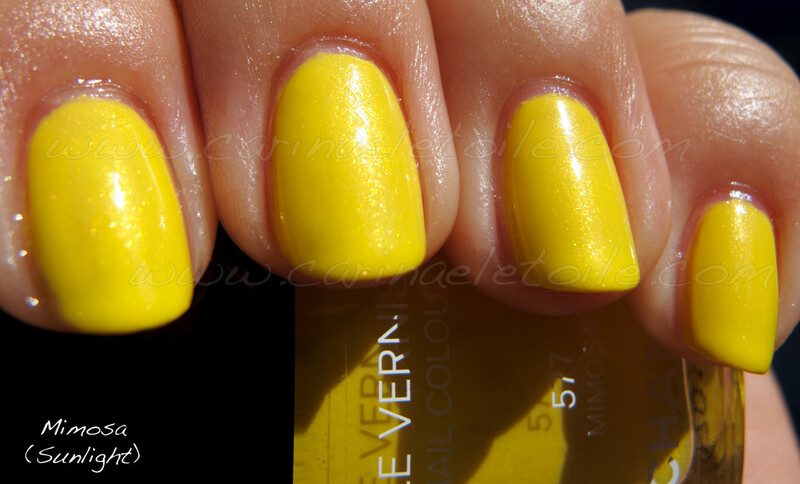 First and foremost, this color really translated extremely well when I took pictures in the shade and sunlight. It translated well enough that this is one of the few colors that are true to life in the shots I’ve taken. I hate yellow nail polish. You know it. I know it. Yet I still purchase them. Why? I secretly live in hope that maybe, just maybe, one day a shade of yellow will be released where I don’t look jaundiced when wearing it. I have a terribly hard time finding a yellow like that. I have envy for the former Corazon Aquino, who chose yellow as her color to lead the Philippines into democracy…and the fact she could carry it off. 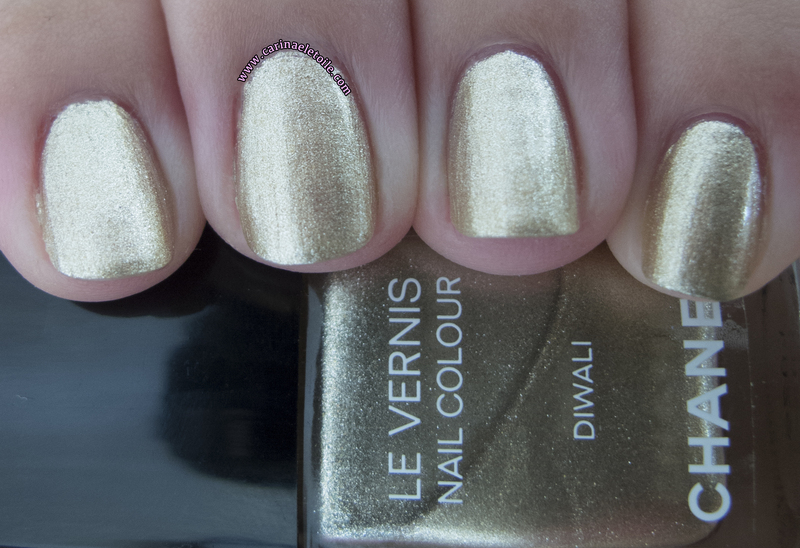 There is a slight shimmer that runs in Chanel Mimosa…and it shows! There is no rumor, it’s a fact and it shows right in this shot. Right out of the gate – BOOM! Pretty shimmer/shine/glitter. I’m quite happy with it. But you see the full on shimmer right here. How gorgeous is it? When I was wearing Chanel Mimosa, I kept thinking, “This yellow reminds me of when I had to do crossing guard duty back in grade school at St. Clare’s in Santa Clara.” Crossing guard yellow. How I hated those yellow coats (if it was raining) and bright orange belts we had to wear. 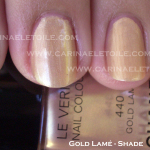 Grrr…Anyway, terrible flashbacks aside, this color is one I actually think I am going to wear. Despite the chalky application, it wasn’t like Riva. Riva was the stuff nightmare polishes are made of. Instead, this color was slightly chalky. However, it smoothed out after 3 coats and it dried quickly with no lumps. 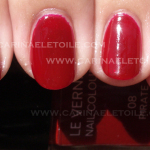 I think the streaky parts you see in the pictures are really my issues – I love polish, but am terrible at putting it on. 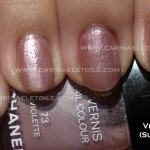 I wish this color could have been opaque in two coats, but it seemed to fine in three. However, I’m sure you are better at putting on polish than I am. Happy Monday! Hope you like this yellow. I love this yellow! I just took some pics of the eye shadow, will post soon!